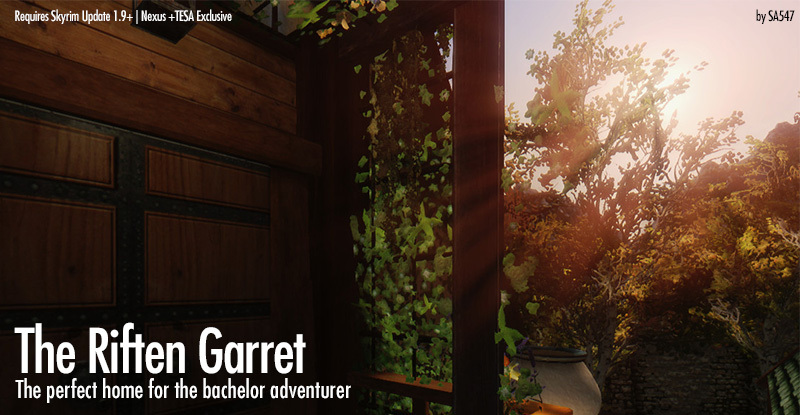 The perfect home for the bachelor adventurer. 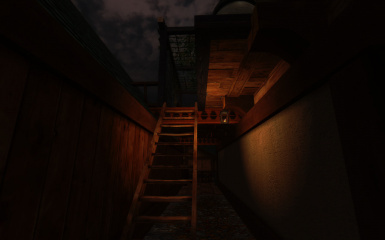 Uploading this mod to sites other than Nexus or TESA is prohibited. FPI Research (TESA) for their mini-smelter/smelting pot static model. 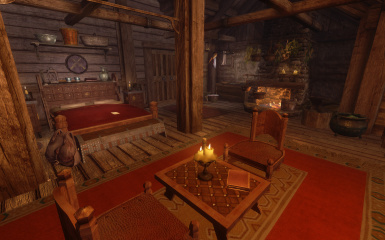 Need a place to crash in while at Riften, but can't afford Honeyside yet? Or wish for an extra home for followers? 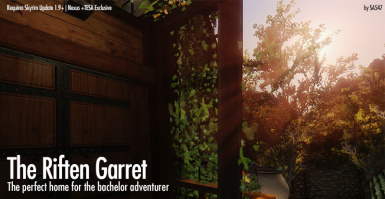 Or that you want a home that can satisfy most of your needs? 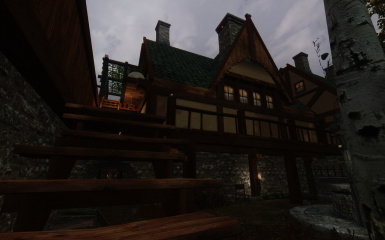 Built into the Snowshods' manor is the Riften Garret. Simple, out-of-the-way, and fills in the boxes. 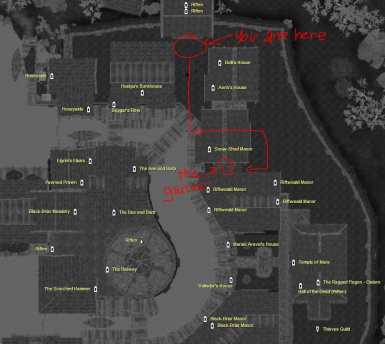 :) No god items, just ready for habitation. 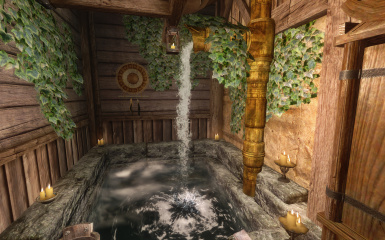 Auto-strip/re-equip for followers whenever they take a bath, and auto-strip (but no reequip) for your character if he/she sits in the tub. 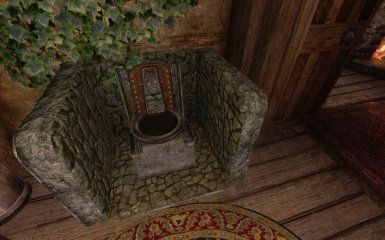 The legendary Gallus, then the scholarly Guildmaster of Riften's notorious Thieves' Guild, where under his leadership his guild rose to prominence in the underworld, and at the same time obtained wealth and influence, needed a home for which to easily manage the guild on a day-to-day basis and at the same time allow him to entertain influential guests in complete privacy. 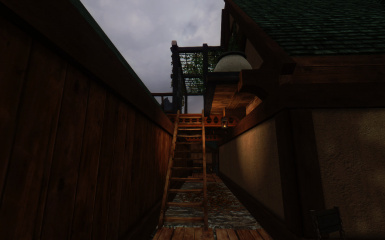 So with the permission of the Snow-Shods (and generous payments of Septims), he had the Garret constructed right above the manor, and reflecting his intellectual prowess, had the home equipped with bookshelves to fit most, if not all, of the knowledge and lore of Tamriel he obtained easily, and then when not at duty would spend his free time reading books obtained across the continent and committing his thoughts to paper on a desk, even editing several rare books concerning the Guild and the Nightingales. 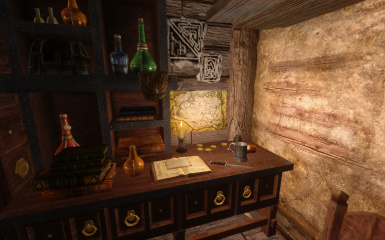 To keep his gear in proper fighting condition, to prepare weapons and armor, and to create potions and poisons needed for specialized work, and with the help of a trusted friend in the College of Winterhold, he also had an enchanting and alchemy table made to order, and moved in several pieces of crafting equipment. 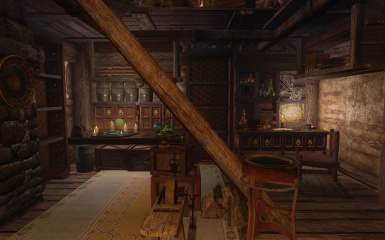 At the end of the day, Gallus would retire to the Garret, strip off his armor and relax in the hot bath, himself he built out of Dwarven pipes and fixtures, thanks to his extensive study of the now-extinct race and their advanced technology. 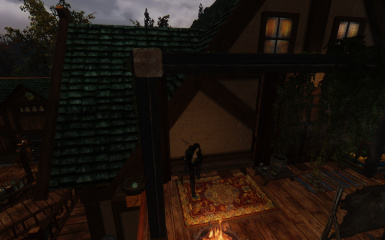 But then the Garret was an also a convenient abode for which to spend intimate time with Karliah, especially on the large bed, as they talked about the future and whom shall be the one deserving to lead the guild if ever should he decides to retire for good. 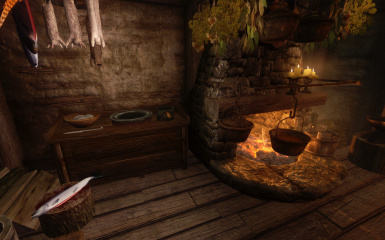 But tragedy fell when Gallus himself became the victim of his own success, leaving the Garret unoccupied, and thus forcing the Jarl to seize the property as her own. 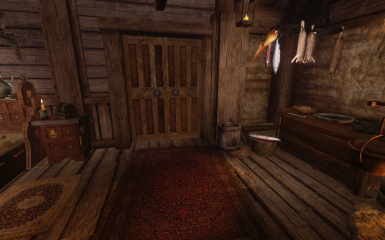 Since then the fortunes of the Guild were reversed, their numbers dwindled, and their wealth vanished, and while many succeeding occupants were able to rent the Garret from the Jarl, for some inexplicable reason the tenants were bestowed with bad luck, which meant the Jarl had the Garret closed for good. 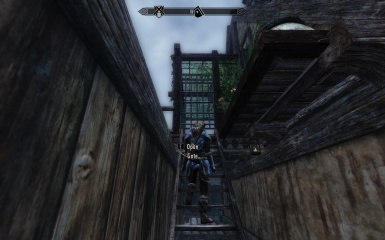 The Garret, now silent, awaits for whoever shall come through its doors, hoping that one would change not just Riften but the rest of the world. 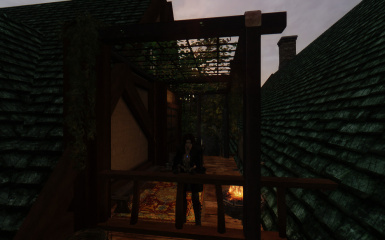 FPI Research (TESA) for their custom mini-smelter model -- what's a master thief if he can't smelt down his loot?